Be prepared for a surprise. 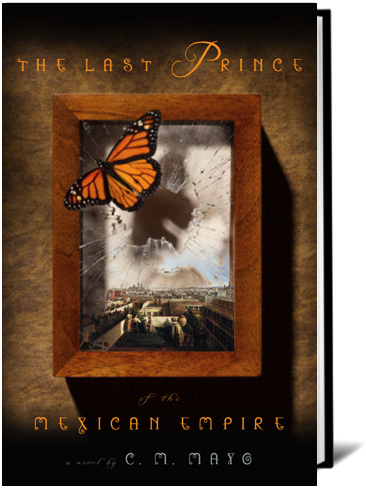 The Last Prince of the Mexican Empire is not about a Mexico youll see on the news, in tourist brochures, travel memoirs, nor in almost any other work of fiction. This is a Mexico of palaces, of pine forests, harpsichords, Arab daggers, and Viennese bonbons, a long ago Mexico when the ex-Archduke of Austria, Maximilian von Habsburg, sat on the "cactus" throne, invited by a clique of Mexican conservatives, blessed by the Pope, backed by the French Imperial Army and opposed, in a struggle-to-the-death, by the Mexican Republics President Benito Juárez and his ally, the United States. A sweeping epic that takes you from a palace ball to an orphanage kitchen, from Brussels to Yucatan, the White House to the Tuileries to the flank of a snow-dusted Mexican volcano, The Last Prince of the Mexican Empire is also, and always, a story about a tiny boy, only two and half-years old, whose Mexican diplomat father and American mother agreed to give him up to Maximilian, to become, so they had supposed, heir apparent to the throne. A fairytale based on the true but never before completely told story the work of seven years of travel and research in archives as far flung as Vienna, Washington DC, and Mexico City it begins, as it must, with, "Once upon a time..."
P.S. I invite you to visit the novel's web page, where you can read an excerpt from the first chapter, about the princes mother, née Alice Green of Rosedale, Washington DC. You will also find extensive notes on the characters, genealogies, a bibliography, a cornucopia of photographs, and much more. "Mayo's reanimation of a crucial period in Mexican history should satisfy history buffs and those in the mood for an engaging story brimming with majestic ambition. "a swashbuckling, riotous good time, befitting the fairy-tale promise of the opening sentence"
"Mayos cultural insights are first-rate, and the glittering, doomed regime comes to life"
"I have read a few sweeping historical novels that have remain inside of me forever. Tolstoy's War and Peace is one of those, Dickens's A Tale of Two Cities is another, Pasternak's Doctor Zhivago is another, and now The Last Prince of the Mexican Empire is another."